When making tasty desserts, good quality butter is a MUST! Lately, I have been using the great organic butter from Grassland that I received for review. I feel great using it and serving dishes made with it because it is certified organic and that is so important to me and my family. Founded in 1904, the Wuethrich family has spent more than a century crafting its award-winning butter. As the world’s largest family-owned butter creamery located in Greenwood, the heart of central Wisconsin, Grassland knows butter. As a leader in innovation with uncompromising quality, Grassland offers a medley of fine butter products specially developed and packed for retail, foodservice and industrial dairy customers. Grassland’s enticing menu of award-winning butter products for dining, cooking, baking and confectionery creations delivers unmatched quality and pure flavor every time. Check out this really tasty recipe that uses Grassland's Butter! Even the sweetest, juiciest berries ascend to the next taste level when they’re paired with luxurious cheeses and a rich buttery pastry crust. For a summer dessert with extra customer appeal, offer the Ricotta and Mascarpone Tart created by Chef Jasper J. Mirabile Jr. of Japer’s Ristorante in Kansas City, MO. The rich pastry crust made with Grassland’s Unsalted Butter perfectly complements a filling featuring two fresh, artisan cheeses. 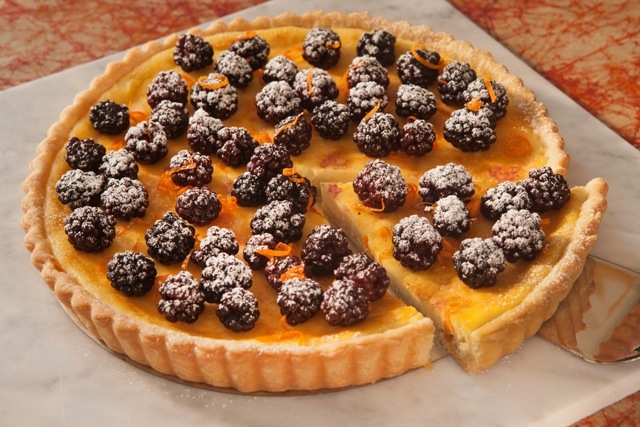 The tart is topped with plump blackberries. With indulgent desserts that feature just a few ingredients, quality counts. Home cooks who bake with Grassland’s Salted or Unsalted Butter appreciate its unparalleled flavor, texture and cooking performance in the kitchen. 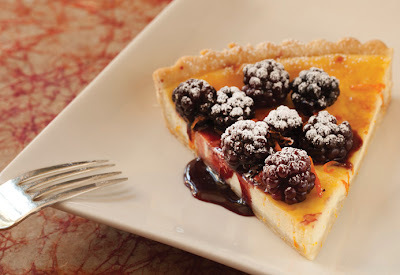 In creating his recipe for Ricotta and Mascarpone Tart Topped with Fresh Blackberries, Chef Jasper J. Mirabile, Jr. starts with a crust made with Grassland Unsalted Butter, flour, sugar, salt and ice water. The tart filling combines two cheeses— Crave Brothers Farmstead Classics M ascarpone and fresh ricotta—with eggs, sugar and orange zest. After chilling both the dough and the filling, the tart is assembled and baked for 30 minutes. Just before serving, it’s topped with two pints of fresh blackberries that have been lightly tossed with a little brown sugar and a teaspoon of orange zest. This simple but rich tart allows the sunny flavors of summer to shine. In a medium mixing bowl, add flour, salt and sugar; mix. Add chilled butter, using a pastry blender cut in until the mixture resembles coarse meal. Continue mixing, adding water as necessary until the dough gathers into a ball. Wrap in plastic wrap, refrigerate until ready to use. In a small mixing bowl, toss blackberries with brown sugar and orange zest. Refrigerate. In a large mixing bowl, add cheeses, sugar, orange zest and eggs; mix together. Chill 30 minutes. Preheat oven to 375ºF. Put the dough on a lightly floured surface, flatten it slightly. Roll the dough to fit 10 inch tart pan. Place crust in tart pan. Add cheese filling. Place on baking sheet, bake 30 minutes. Remove from oven, cool. Add blackberries to top of tart, serve.